I started the week off with three straight floral designs. Alas, I could not find another to conglomerate that I hadn't already worn. Today's necktie is a basket weave. I guess it could be continue the trend somewhat. A flower basket? Another Jos A Bank Signature with the dominant colors being navy and gold and a touch of red in between the weaves. 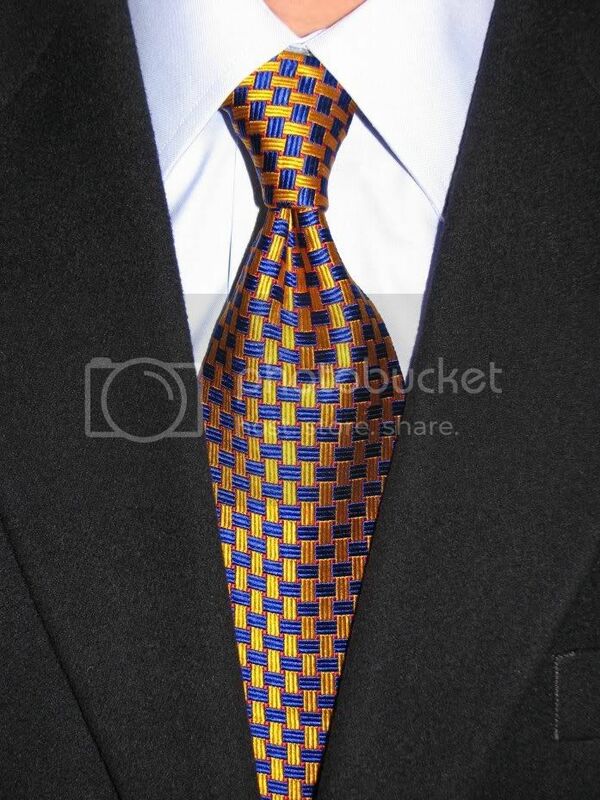 I suspect this is an older model because it is not self-lined like most of the other Signature ties I have. I also a few other Signature ties that are not self-lined but they are not in nearly as good condition as this one. The dress shirt is a blue spread collar pinpoint. I'm beginning to like spread collar shirts more since they tend to show more of the tie knot. What other sport coat could I have conglomerated other than the navy? The gray, I guess.